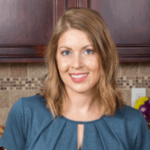 Published: Jan 26, 2016 · Modified: Apr 12, 2019 · By Jen Sobjack · This post may contain affiliate links. 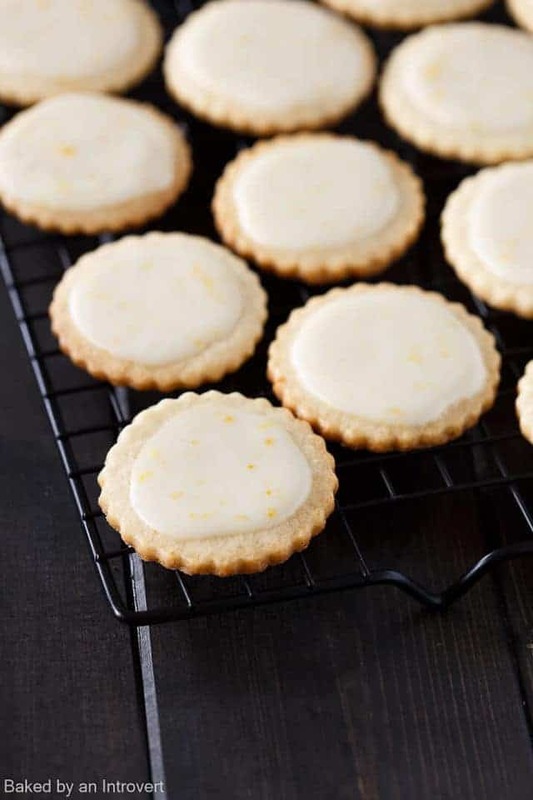 These Iced Meyer Lemon Cookies just the thing to cure those wintertime blues. The cookies are tender yet crisp, packed full of Meyer lemon flavor, and topped with a sweet Meyer Lemon Glaze. They are sure to bring a smile to your face after just one bite! The perfect winter citrus cookies to satisfy those bright sunny cravings! 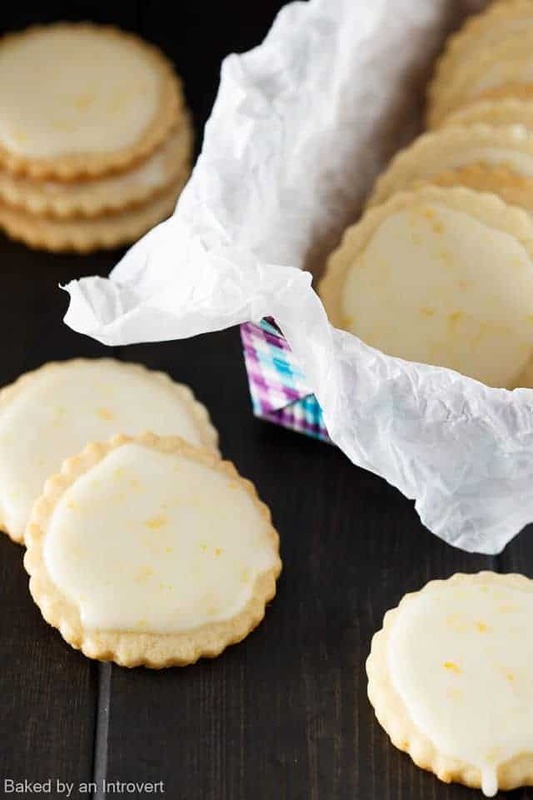 Thin, crisp cutout out cookies with tons of Meyer lemon flavor. Much different than my lemon thumbprint cookies. Cornstarch is added to make the cookies tender yet crisp. Rolling out the dough and freezing it for 20 minutes before using cookie cutters makes the dough easier to handle. 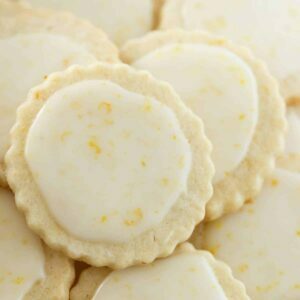 Meyer lemon juice and zest yield a sweet fragrant cookie, and the glaze enforces the Meyer lemon flavor. I can’t help but get excited when I see Meyer Lemons at the store. They are nothing like an ordinary lemon. They are a cross between a lemon and an orange. They are sweet, fragrant, and extremely delicious. I snatched up a healthy bunch of Meyer lemons the last time we were out shopping and could not wait to use them. In the very early days of Baked by an Introvert, I made these Meyer lemon cookies. They were soft, pillowy, and featured my favorite citrus. And while those cookies are good, they are much more on the lighter side. Today’s iced Meyer lemon cookies are the complete opposite. 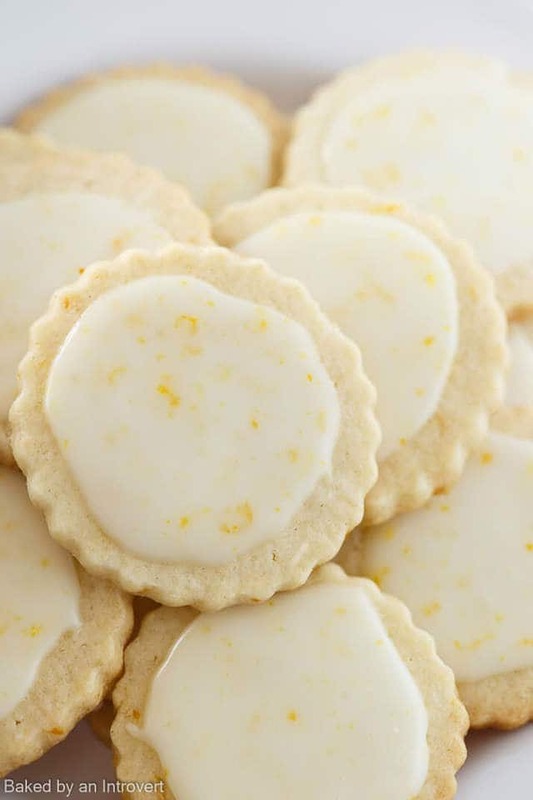 They are sturdy cutout cookies flavored with the juice and zest of Meyer lemons. The icing is thick with speckles of brightly colored zest. I’m really happy with how the dough held up. I adapted this lemon cookie recipe from Cook’s Country and couldn’t be more pleased with the results. I did cut back on the butter and needed to use more flour in order to achieve a firm dough so the cookies wouldn’t lose their shape while baking. The end result was a highly addictive iced Meyer lemon cookie! They were so good, in fact, I had to force my husband to take them to his co-workers. He wanted to keep them for himself, but I knew if they hung around I’d be the one to eat them all. The perfect winter citrus cookies to satisfy those bright sunny cravings! These Iced Meyer Lemon Cookies just the thing to cure those wintertime blues. The cookies are tender yet crisp, packed full of Meyer lemon flavor, and topped with a sweet Meyer Lemon Glaze. They are sure to bring a smile to your face after just one bite! Combine 1 and 3/4 cups of the flour, cornstarch, salt, baking powder, and baking soda in a medium bowl. Stir with a whisk. In a large bowl of a stand mixer fitted with the paddle attachment, beat the butter and sugar on medium-high speed for 3 minutes, until pale and fluffy. Add the lemon juice, zest, and eff yolk. Beat until well combined. Reduce the speed to low and add the flour in 3 additions. Beat until just combined, scrape the sides of the bowl as needed. The dough should easily hold together and not be sticky to the touch. If the dough is sticky, gradually beat in the remaining flour. Divide the dough in half and roll each roll one portion at a time in between 2 sheets of parchment paper to 1/4-inch thickness. Leave the dough in the parchment paper and stack it on a cookie sheet. Freeze the dough for at least 20 minutes to make it easier to handle while cutting. Use a 2-inch round (or any shape you like) cookie cutter and cut as many rounds as you can. Reroll the scraps up to 2 times to a similar thickness, freeze, and cut out remaining rounds. Place the cookies 1 inch apart on a cookie sheet lined with parchment paper or silicone mat. Bake one sheet at a time for 12 to 14 minutes, until the edges are lightly brown. let the cookies rest on the pan for 5 minutes before transferring to a wire rack to cool completely. Repeat until all the cookies are done. Whisk the sugar and lemon juice together in a bowl, adding 1 tablespoon of juice at a time, until the icing is spreadable. Stir in the zest. Spread the icing over the cookies. Let the iced cookies set fully before serving. Can the iced Meyer lemon cookies be frozen after baking? Yes! Just let them cool completely and freeze them in an airtight container. How long will they last in the freezer? They should be fine for up to 3 months. Made these for Christmas and they are an immediate entry in the “we need these for christmas every year” category. So good! That’s wonderful to hear! I’m so happy everyone enjoyed them! 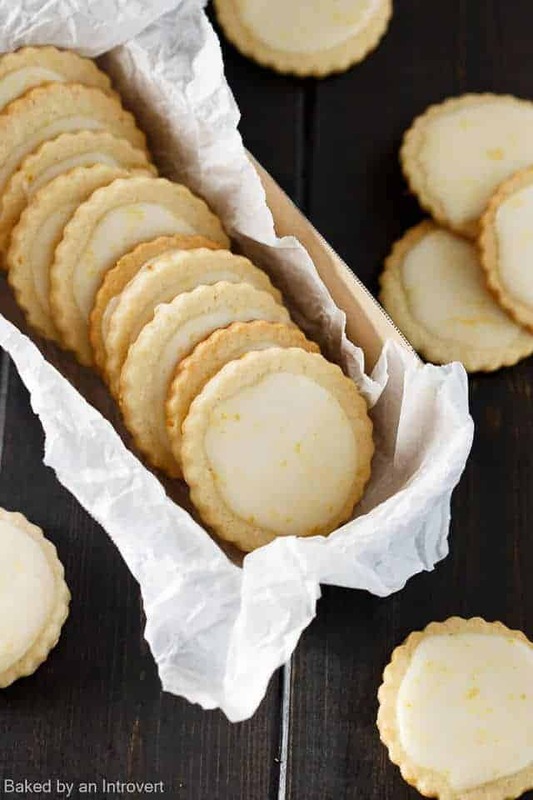 Love these Meyer lemon cookies, they look beautiful! Need to try them, because I’ve been on a savory kick lately and starting to miss my sugar! These cookies would be the perfect thing to break that savory streak, Mira! I’m still waiting for my stores to start carrying meyer lemons!! These cookies look amazing! What? They don’t have Meyer Lemons yet?! They need to get on it!! You have to make them! I’m sure your husband would be grateful! Although lemons are great in the winter, they totally remind me of summer and I’m so ready. Starting with these delicious cookies!! I feel you, Aimee! Lemons are so bright and vibrant, they just scream summer! Lemon and cookies are my two favorite things right now — these look SO good! I attempted some lemon cookies this past weekend and they did not come out nearly as perfect as these cookies! I love meyer lemons and that icing on top sounds perfect! I love taking advantage of citrus at this time of year. In fact, I just used some limes in our chicken dinner this evening. It might be cold and gray outside, but those lemons and limes make anything taste fresh and bright. These look delicious! I love that lemon flavor, and I love the look of the speckles in the icing. These are so dainty and pretty! These look gorgeous Jen! They can definitely cheer me up on this gloomy day! These cookies are beautiful, Jen! Meyer lemons are my favorite so I know these would not last long at our house at all! Love love love the glaze! Oh I adore lemon! I love it so much it was actually our wedding cake! These look amazing! Lemon is a fantastic citrus! These are such gorgeous little tea cookies, Jen! I’m so pumped for Meyer lemon season and these cookies absolutely need to happen! Thanks, Sarah! I simply can not get enough Meyer lemons! I’m the same as you, I love seeing meyer lemons, too! These cookies look gorgeous, Jen! I love the pretty frosting on top. These wouldn’t last long in my house, as I would devour them in no time! Meyer lemons are the best. And I definitely had to restrain myself around these cookies. I’m sure you’d love them.